150 Years Ago in Jerusalem -- This Is the Place for Photographs. Befitting its name, the Israel Daily Picture site focuses on century-old photographs from Eretz Yisrael, but the confluence of three visitors to the Holy Land almost simultaneously 150 years ago brings us today to focus on their words, not just the photographs of their time. Are these tourists Twain's colleagues? ﻿Another confluence, this one of the technology of the steamship and photography, helped spur tourism to Palestine, suggests Kathleen Stewart Howe, an American curator and historian of photography. The author of Revealing the Holy Land, the Photographic Exploration of Palestine, Stewart Howe explained in a recent lecture, "Photography and travel to the Holy Land were an interlocking system... Photography encouraged tourism and travel; tourism consumed photography." 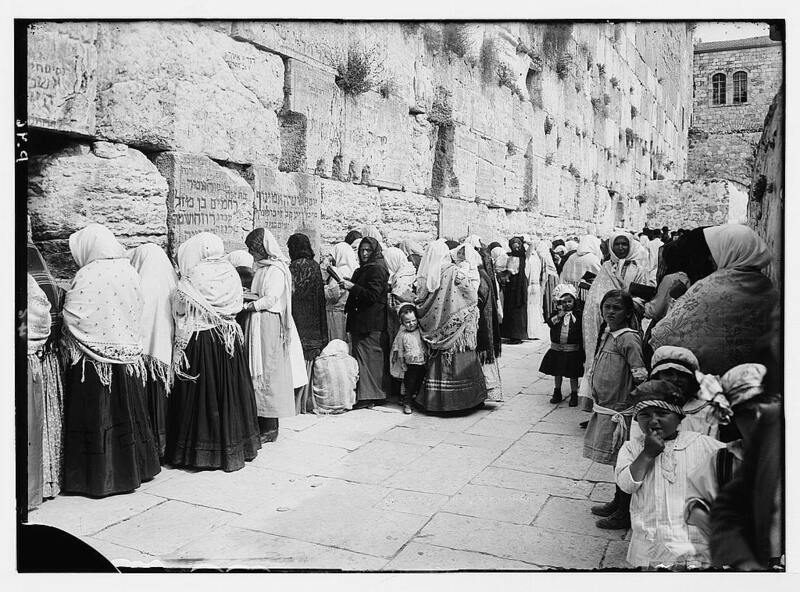 Eighteen thousand tourists visited the Holy Land on organized tours between 1868 and 1880, she reported. The American author and humorist Mark Twain visited the Holy Land in 1867 as part of a tour group consisting of "64 pilgrims and sinners." He filed dispatches to newspapers in the United States and then republished them as Innocents Abroad. [We continue to investigate whether pictures we found in the Library of Congress collection may be Twain's traveling partners posing in front of the Old City's Golden Gate.] View an earlier posting on Twain's visit here. 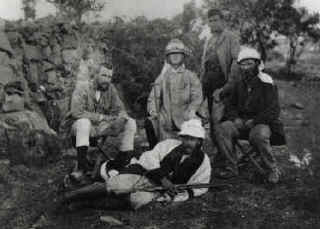 Warren, seated on the left, and his team. According to historians, Twain and his party stayed at the Mediterranean Hotel in Jerusalem's Old City at the same time as the British expedition led by Charles Warren, a co-author with Charles Wilson of The Recovery of Jerusalem, a Narrative of Exploration and Discovery in the City and the Holy Land. 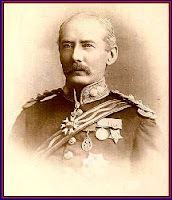 Wilson's 1865 Ordnance Survey included many photographs by Sgt. James McDonald. 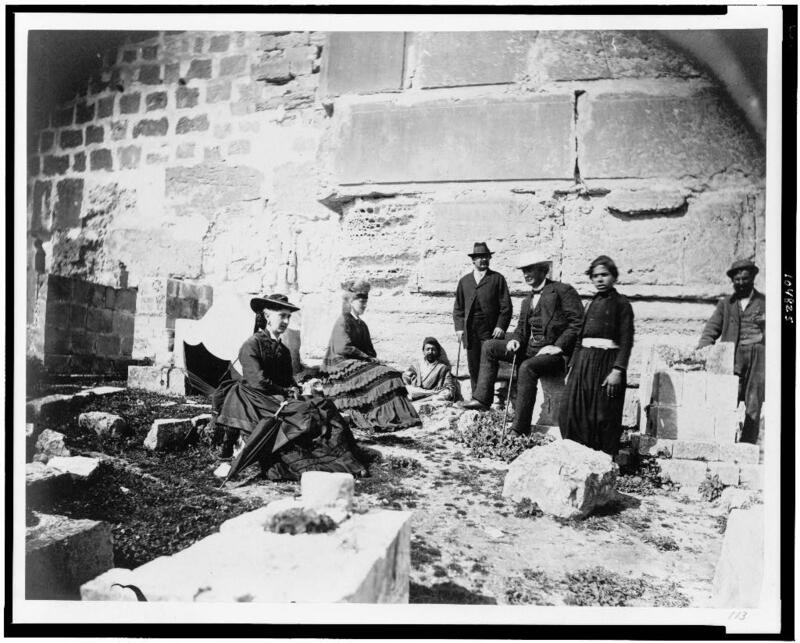 Could the photos of the Jerusalem "tourists" have been taken by Warren's photographer, Corporal Henry Phillips two years later? The third writer, William Seward, visited Palestine in 1859 and again in 1871. 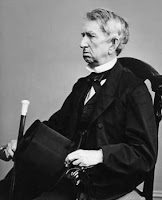 Seward served as President Abraham Lincoln's Secretary of State and was wounded in his home by one of John Wilkes Booth's accomplices on the same night that Lincoln was shot. Mary Todd Lincoln told the Springfield, Ill. pastor who presided at her husband's funeral, "He [Lincoln] said he wanted to visit the Holy Land and see those places hallowed by the footprints of the Saviour. He was saying there was no city he so much desired to see as Jerusalem." We surmise that Lincoln had heard about Jerusalem and the Holy Land from his Secretary of State. Wilson: It is difficult to obtain statistical information on Jerusalem, but one fact alone will show the unhealthy nature of the city: The Jewish population is estimated at about 9,000, yet in twelve months, more than 13,000 cases of sickness were attended to in their own hospital and that of the Protestant Mission. Seward: The population of Palestine is estimated at only 200,000.... Jerusalem is divided now according to its different classes of population. The Mohammedans are four thousand, and occupy the northeast quarter, including the whole area of the Mosque of Omar. The Jews are eight thousand; and have the southeast quarter.... The Armenians number eighteen hundred, and have the southwest quarter and the other Christians, amounting to twenty-two hundred, have the northwest quarter. Wilson: I offered to take Jews upon the [excavation] works; but though some came to try it, one day was always quite sufficient for them, they were quite unused to the hard work. I had, however a Jewish overseer, that it a man who kept above ground, and beat the men with his corbatch [or kurbash, leather strap] when they were idling. He was a first-rate fellow, and was called by the fellahin "the devil" -- the only Jew I met in the country was was not afraid of the natives. Seward: For centuries (we do not know how many) the Turkish rulers have allowed the oppressed and exiled Jews the privilege of gathering at the foot of this [wailing] wall one day in every week, and pouring out their lamentations over the fall of their beloved city, and praying for its restoration to the Lord... The Jewish sabbath being on Saturday, and beginning on Friday, the weekly wail of the Jews under the wall takes place on Friday. Twain: At that portion of the ancient wall of Solomon's Temple which is called the Jew's Place of Wailing, and where the Hebrews assemble every Friday to kiss the venerated stones and weep over the fallen greatness of Zion, any one can see a part of the unquestioned and undisputed Temple of Solomon, the same consisting of three or four stones lying one upon the other. To your list of travelers and writes you should mention and quote Herman Melville who visited Jerusalem in 1857 and stayed at the first location of the Mediterranean hotel, and wrote his poem "Clarel: A Poem and Pilgrimage in the Holy Land"